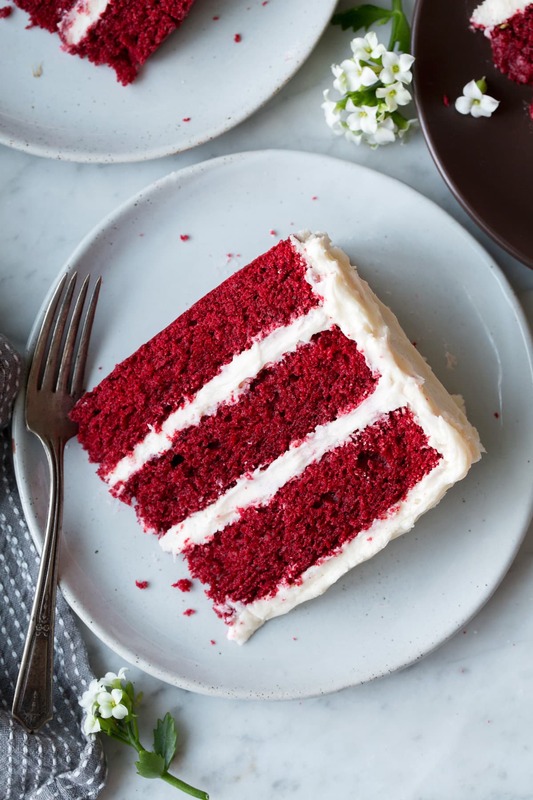 The only Red Velvet Cake recipe you’ll ever need! It’s soft, moist, fluffy, rich, strikingly beautiful and decadently delicious. A cake fit for any celebration and sure to impress! 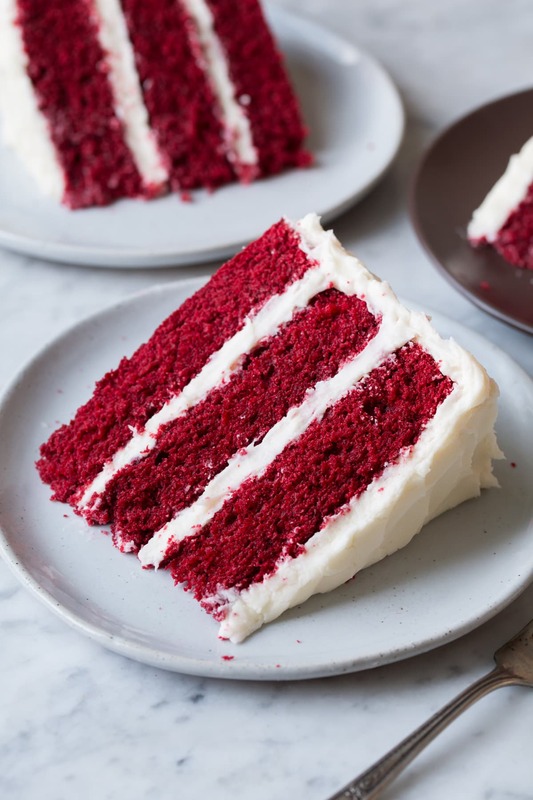 The Best Red Velvet Cake Recipe! There’s nothing quite like a decadent piece of red velvet cake covered in cream cheese frosting is there? I love that it’s a unique flavor all it’s own. This cake is one of my favorite cakes and it’s perfect for the holidays because its color is so vibrant and festive. Valentines, Christmas, July 4th and birthdays are always a good reason to make red velvet cake! And this isn’t just any red velvet cake. 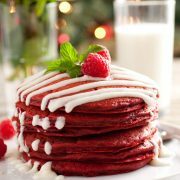 This is thee red velvet cake you need in your recipe box!! This is my version that I’ve tested and re-tested and tweaked and perfected. Everyone always loves it and I think you’ll find it to be the the best out there too! It’s lightly tangy from the buttermilk and vinegar. Slightly chocolatey thanks to the cocoa. You get delicious background notes of vanilla flavor to compliment everything. My version is deliciously buttery. 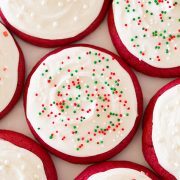 Many red velvet cakes are oil based but butter is so much better! There’s also a faint, traditional flavor from the red color. And the luscious cream cheese frosting just perfectly highlights it all. 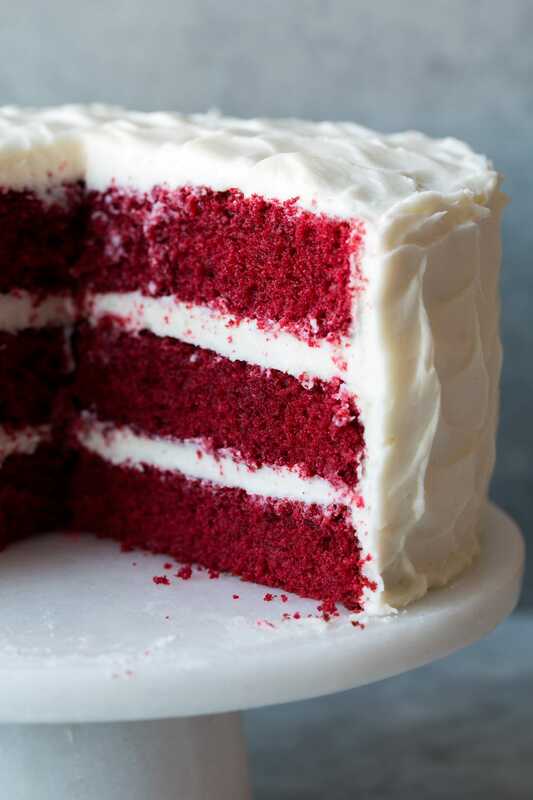 How do You Make Red Velvet Cake from Scratch? 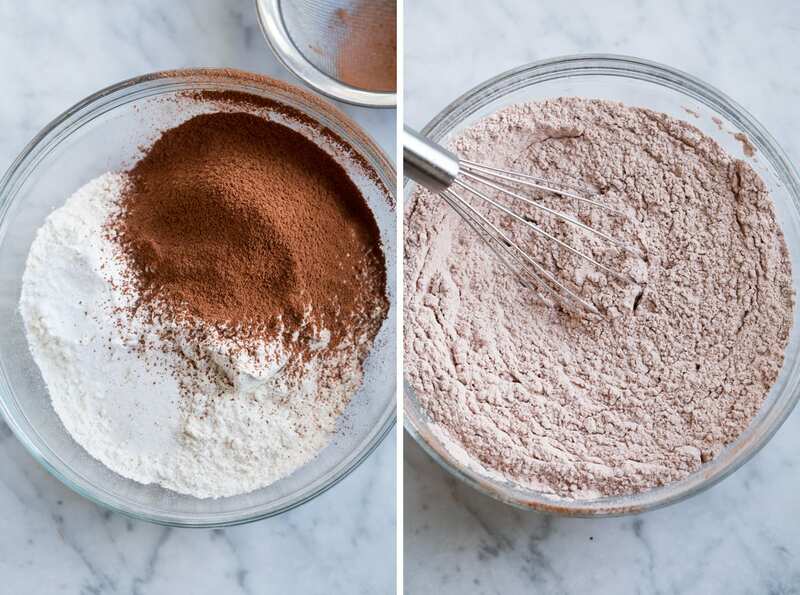 Whisk dry ingredients: Add flour, baking soda and salt to a large mixing bowl. Sift in cocoa powder then whisk mixture 20 seconds, set aside. 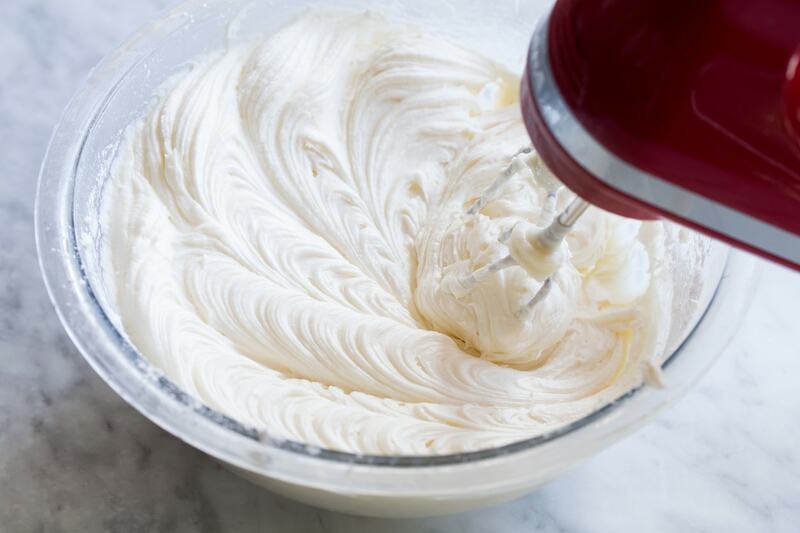 Cream fats and sugar: In the bowl of an electric stand mixer fitted with the paddle attachment, whip together sugar and butter until pale and fluffy (this will take several minutes whipping on high speed). Mix in vegetable oil. Scrape down bowl. Blend in eggs and color: add in eggs one at a time, mixing just until combined after each addition. Mix in egg yolks then red food coloring. Scrape down bowl. Whisk wet ingredients: Mix together buttermilk, vanilla and vinegar (in liquid measuring cup is fine). Mix in dry and wet mixtures: Add in flour mixture in 3 additions alternating with 2 additions of buttermilk mixture, mixing just until combined after each addition. Fold batter: Scrape down sides and bottom of bowl and gently fold batter just to ensure it is evenly incorporated. Pour into pans: Divide mixture evenly among three prepared baking pans. Spread into an even layer. 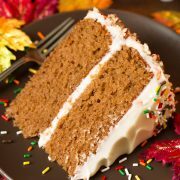 Bake just until set: Bake in preheated oven 25 – 30 minutes until toothpick inserted into center of cake comes out clean. Cool before frosting: Cool in pan 10 minutes then run knife around edges of cake to loosen and invert onto wire racks to cool completely. 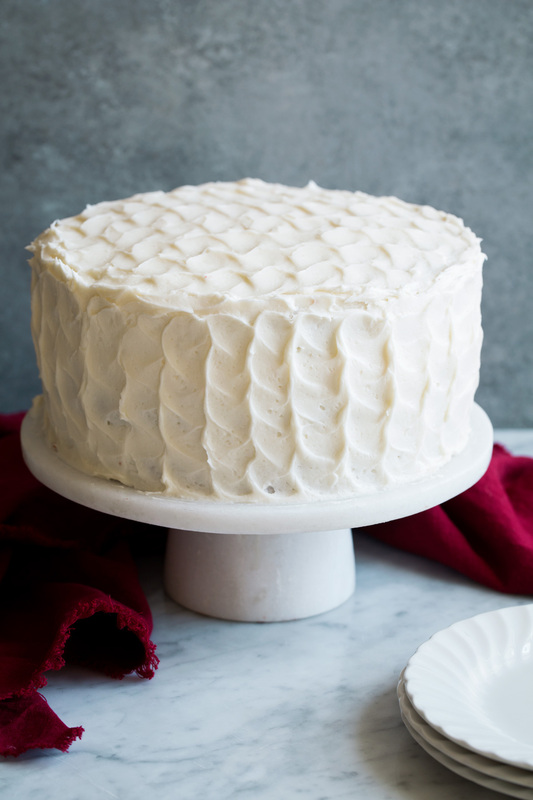 How do You Make Cream Cheese Frosting for Red Velvet Cake? Mix fats: Mix cream cheese and butter in a large mixing bowl using an electric hand mixer until smooth and fluffy (or alternately use stand mixer). Mix in remaining: Mix in vanilla and powdered sugar and whip until light and fluffy. Spread over cooled cake. Tip: For a better consistency you can freeze in 3 – 5 minute increments, mixing between increments, until desired thickness is reached. What’s the Difference Between Chocolate Cake and Red Velvet Cake? The biggest difference comes down to the amount of cocoa added and the color. Chocolate cake usually has around 3/4 cup cocoa added whereas red velvet cake only has a few tablespoons (some recipes teaspoons). Can I Freeze Red Velvet Cake? Yes. You can freeze unfrosted layers up to 2 months. Cool completely wrap in plastic wrap and then in foil, place in an airtight container and freeze. Thaw at room temperature, add cream cheese frosting. Really whip the butter and sugar. It should turn from a yellow shade to an off white shade. This is incorporating air bubbles which will lift the cake as it bakes (along with the help of the baking soda and eggs). Use a blend of oil and butter. Butter adds great flavor but oil produces moister cakes. Add egg yolks. Egg yolks have natural emulsifiers so they give the cake more structure, meaning you can add more fats and sugars without the cake sinking in the middle. They also give a softer crumb. Mix in a lot of red color. It seems like a lot but to get that vibrant red color you will need the whole bottle. For a natural option try beet powder. Don’t over-mix the batter or it will end up dense. Once you start mixing in the flour and buttermilk only mix just until combined. Don’t over-bake or it will start to dry. Mine is perfect at 26 minutes but each oven varies a bit so do the toothpick test for doneness. A moist crumb attached if fine but there shouldn’t be batter. After about 20 minutes of cooling on the wire rack I actually like to drape plastic wrap around the cakes while cooling (not covering the bottom), this keeps those edges from drying out. The ultimate red velvet cake! It's a decadent, flavorful, gorgeously red and tender cake topped with a sweet, rich cream cheese frosting. It's perfectly melt-in-your-mouth fluffy and amazingly moist. A dessert that's sure to impress! 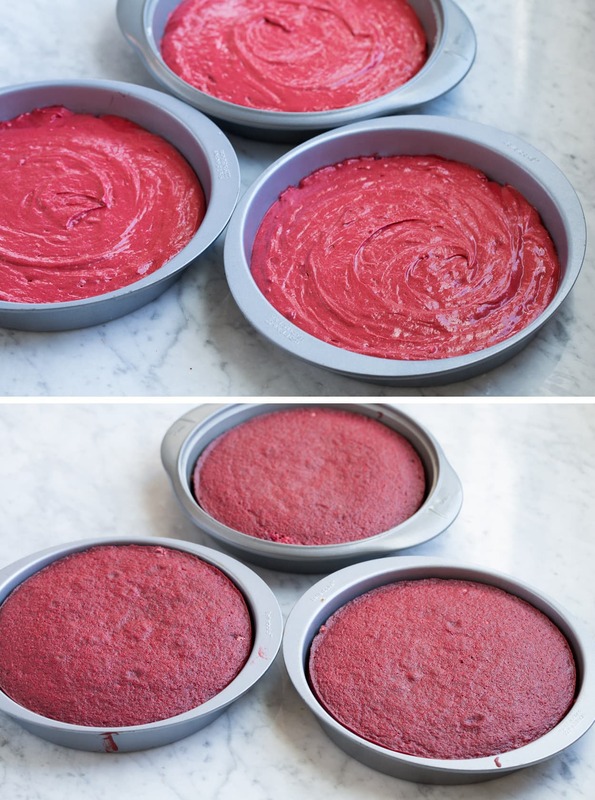 For the Red Velvet Cake: Preheat oven to 350 degrees. Butter 3 (9-inch) round cake pans then line bottom of each with a round of parchment paper and butter parchment, set aside. Add flour, baking soda and salt to a large mixing bowl. Sift in cocoa powder then whisk mixture 20 seconds, set aside. In the bowl of an electric stand mixer fitted with the paddle attachment, whip together sugar and butter until pale and fluffy (this will take several minutes whipping on high speed). Mix in vegetable oil. Scrape down bowl. Blend in eggs one at a time, mixing just until combined after each addition. 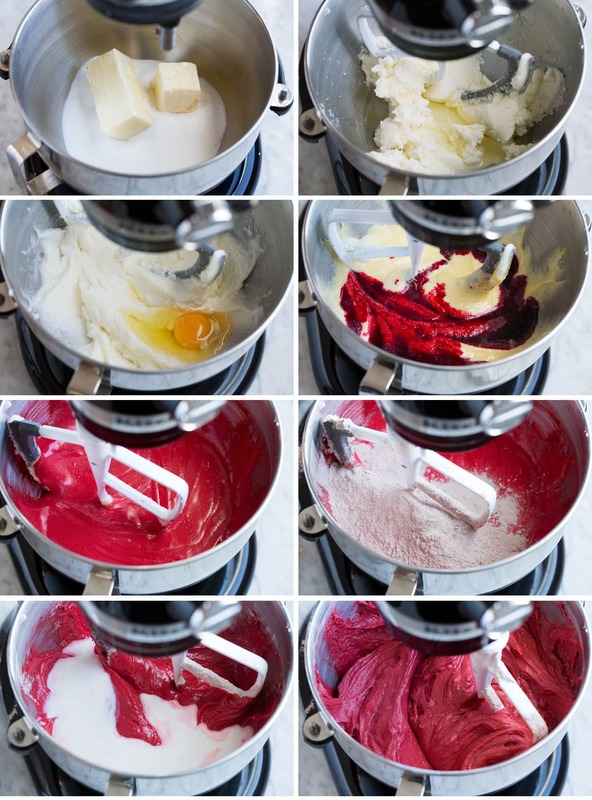 Mix in egg yolks then red food coloring. Scrape down bowl. In a liquid measuring cup, measure out buttermilk then whisk in vanilla extract and vinegar. Working in three separate, beginning and ending with flour mixture, add 1/3 of the flour mixture alternating with 1/2 of the buttermilk mixture and mixing just until combined after each addition. Scrape down sides and bottom of bowl and gently fold batter just to ensure it's evenly incorporated. Divide mixture evenly among three prepared baking pans. Spread into an even layer and bake in preheated oven 26 - 30 minutes until toothpick inserted into center of cake comes out clean. Cool in cake pan 10 minutes then run knife around edges of cake to loosen and invert onto wire racks to cool completely. Once cool, frost with Cream Cheese Frosting. Store cake in an airtight container in refrigerator. For the Cream Cheese Frosting: Mix cream cheese and butter in a large mixing bowl using an electric hand mixer until smooth and fluffy (or alternately use stand mixer). Mix in vanilla and powdered sugar and whip until light and fluffy*. Spread over cooled cake. At this point I like to freeze frosting for about 5 minutes then mix again for a more stable consistency. Recipe first shared Nov. 2014. Recipe updated to include only 3 Tbsp cocoa instead of 4 Tbsp previously listed for a slightly more vibrant red. Also frosting increased by 1/4 of the original amounts. Sam: I have yet to find a recipe with the original frosting. Everyone now has a cream cheese frosting 🤔 It’s the frosting that makes the cake.